A Stitcher’s Christmas Winners & a Reader’s Finish! Oooooh, a jolly good morning to you, from a frigid (and somewhat snowy) Kansas! It’s time to finalize A Stitcher’s Christmas, 2017! Shortly, I’ll announce the winners of the last two drawings – the stitching supplies from Needle in a Haystack and the exquisite embroidery scissors from The French Needle. 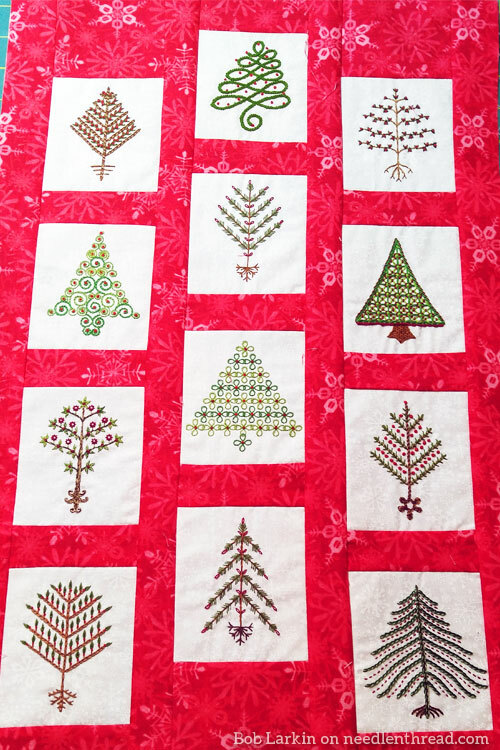 To spread some more Christmas cheer, I’m also going to show you a magnificent Christmas finish from Bob, who stitched up my Twelve Trees for Christmas in record time, and even finished them into a Christmas wallhanging! What a guy! He was finished well before the Christmas bells were ringing! 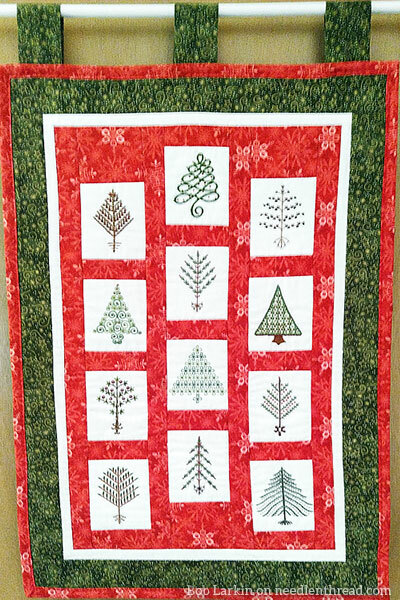 Bob Larkin took each of the twelve trees in Twelve Trees for Christmas and built them into a colorful seasonal wallhanging, quilted and beautifully finished. I love it! And what a great idea for combining the trees all in one neat, perfectly wrapped Christmas finish. Needless to say, the photos really cheered me! I love seeing what you all do with my e-books and designs. I always hope they bring you a lot of stitching pleasure, and when I see finishes like this, it makes me all warm and fuzzy and happy inside! Thanks, Bob! You did a beautiful job! So, the final winner’s for the last two installments of A Stitcher’s Christmas, 2017. Ready? The randomly drawn winners for A Stitcher’s Christmas #8 – the lovely packages of needlework supplies from Needle in a Haystack – are Donna Fricker and Caitlyn S! And the randomly drawn winner for A Stitcher’s Christmas #9 – the exquisite hand-crafted embroidery scissors from The French Needle – is LacySuzette! I’ll drop you all an email today to get things rolling, so that you can enjoy your new Christmas gifts soon. Many, many thanks, again, to all the designers and businesses who joined up with me for A Stitcher’s Christmas, 2017! Here they are, in order, in case you’re looking for some unique kits, tools, accessories, books or supplies to get 2018 off to a great start. Supporting small needlework businesses helps to keep the art of embroidery alive for you and for future generations, so if you have the opportunity to shop through them, I heartily encourage you to do so! The French Needle – importers of unique needlework kits, supplies, books, tools, and other products from France and other European countries. The give-aways were a lot of fun, and thanks to all of you who participated. Maybe we’ll do it again next year? I’m taking a short break for a couple days, and I’ll be back with you on Friday with something special. See you then! December 22, 2017 A Stitcher’s Christmas #9: Exquisite Embroidery Scissors! December 21, 2018 A Stitcher’s Christmas, 2018: An Exquisite Pair of Scissors! Oh, what a splendid idea! How pretty! Hi Mary. Thanks for sharing Bob’s creation! Great job, very festive & his next family heirloom, to be sure. Thank you again for hosting Stitcher’s Christmas—your partners pulled out all the stops! I am very thankful to be the lucky stitcher who will be using The French Needle handmade scissors in 2018. BUT, I also wanted to say how much I enjoyed reading the responses to your “most memorable” needlwork question. In addition to the Bayeux Tapestry, Unicorn series & other museum pieces, there are many memorable family heirlooms! I was also heartened by the number of readers who mentioned the EGA National Tapestry. This bodes well for the future of our mutual love of stitching. Thank you again for such a wonderful Merry Christmas! Congratulations to all the season’s winners! And thanks again to Mary and the many product contributors. It was inspiring to have attention drawn to these wonderful supplies for resources and stashes. And it has been fun to read our stitching community’s comments as well. Happy new year to all! Congrats to you LacySuzette. That has to be the most gorgeous pair of scissors I’ve ever seen! What a lovely wall hanging he has made! His family will treasure every year! Have a wonderful New Year Mary, and I look forward to your new projects and blog in 2018! Wow, Bob!! Awesome job!!! Really well done. I like these trees a lot…think I will work them into the embroidered ornaments I am working on for Christmas next year. They should work out really sweet! Thanks so much! Next Next post: It’s 2018 – Happy New Year!